Justin Faryna. Pic: Richard Murray. 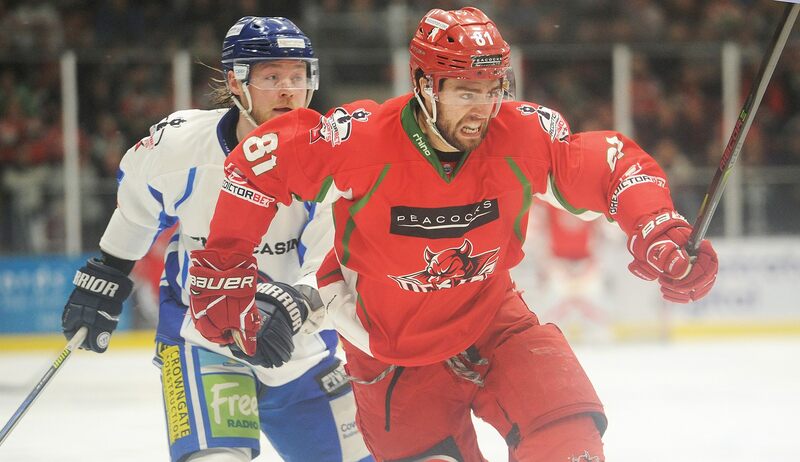 Canadian forward Justin Faryna has left Cardiff Devils. The spark plug winger from Calgary, a hugely popular player among fans, was in tears when he told Devils team-mates that he was leaving. His departure has come as a massive shock to the Elite League champions, but they will move to bring in another import forward over the next few weeks. Calgary-born Faryna’s decision, for personal reasons, has nothing to do with ice hockey and does not immediately impact on Devils in terms of import numbers. Andrew Lord celebrates with Justin Faryna last season. Pic: Richard Murray. They have one extra player than they can ice in any match. Drew Scheistel was rested from their matches last weekend because of a minor niggle and will return for the home match against Guildford Flames on Wednesday. British defenceman Mark Richardson is also close to playing again, which will be a major boost. Faryna spoke to Andrew Lord for the first time about leaving on Saturday morning before the team flew to Scotland to take on the Fife Flyers. He told teammates after the home game against the Dundee Stars on Sunday. “This came as a big shock to us,” said managing director Todd Kelman. “Faryna has been a big part of our team since he arrived ahead of the 2017-18 season. He played a massive role in our success last season and was hugely popular with our fanbase. “I know they will be saddened to see him go, as we all are, but there is life outside of hockey and this is a decision bigger than this game.